This probably won’t be a very shocking revelation, but I go through a lot of cereal. These years of experience have provided me with the knowledge necessary to properly divide a box into even serving amounts. Despite this experience, occasionally something goes awry, and I am left with possibly the worst thing to happen to a cereal eater short of not having milk – not having enough left in the box for a proper bowl of cereal. At this point, you have a few options – have a sad half-bowl of cereal, throw the rest out, or mix it with another cereal. The last option is usually what I wind up doing, to drastically mixed results. Crunch Berries and Kix? Sure, that works. Honeycomb and Cocoa Krispies? Not so much. Some of these cross-bred cereals wind up getting together to make a super-powered cereal baby. Chocolate Cheerios mixed with Peanut Butter Cheerios? Ridiculous. That makes Reese’s Puff look like a rank amateur. Unfortunately, most of these cereal bastardizations are the result of desperation, not planning. As a result, most of them are awkward. General Mills must have known this was a common occurrence, and assumed that cereal eaters prefer this method. 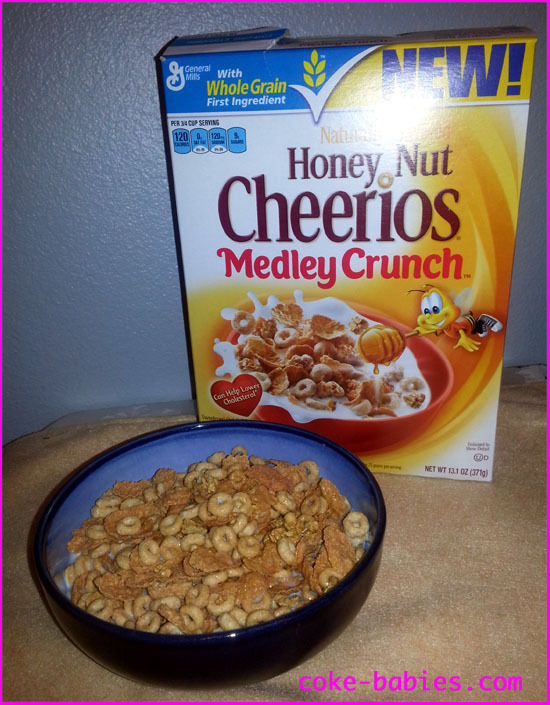 Hence, Honey Nut Cheerios Medley Crunch. Two things immediately jumped out at me when seeing this. The first thing was that it’s a pre-packaged desperation cereal. The second thing was, when did Buzz Bee start wearing Chuck Taylors? Looking at the cereal itself, it presents some problems. When making a desperation cereal, certain rules should be adhered to: flakes go with flakes, puffs go with puffs, and other pieces (like Lucky Charms) go with another piece-based cereal. So Medley Crunch mixing flakes, Cheerios, and granola seemed like an abomination. While eating, my expected issues did come true – bites have an uneven texture and size. This might be good for your jaw, kind of like how running barefoot strengthens your supporting muscles due to the uneven terrain. 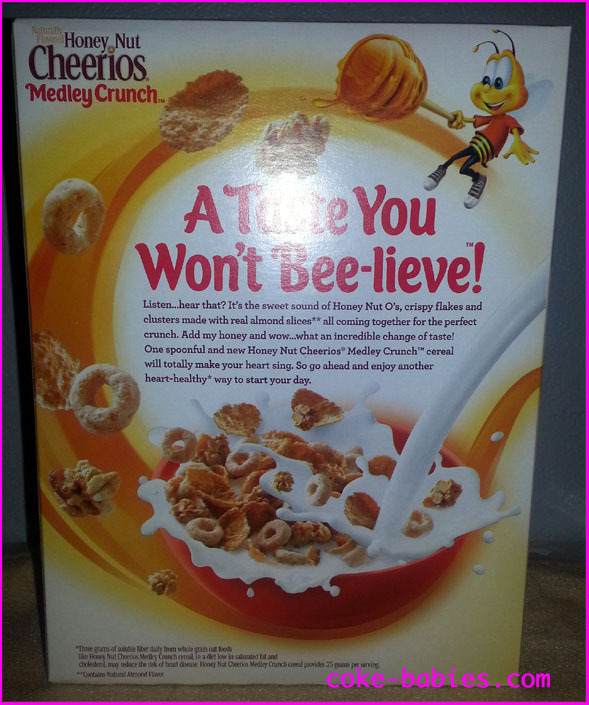 Although I will assume this was not General Mills’s intent. Despite a really weird assortment of textures and shapes, the cereal is by no means bad. In fact, it’s really good. 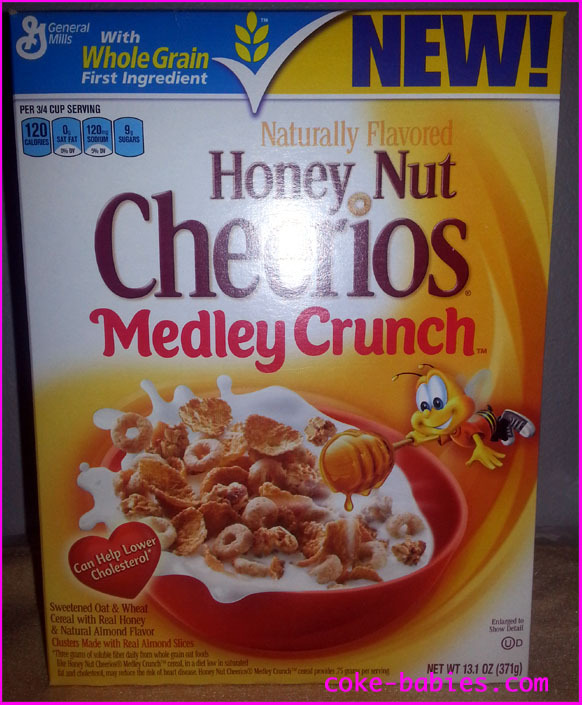 Honey Nut Cheerios are awesome, and the the flakes and granola basically just taste like “Honey Nut Flakes / Granola”. The one misstep in the taste is the weird almond extract flavor. You only get it once in a while, so it doesn’t overpower the taste, but once in a while you’ll get a bite filled with creepy almondness. Thankfully, that doesn’t seep into the milk, and you are left with the usual honey-nut-sugar flavor. While eating Medley Crunch, I highly advise you pay strict attention to the bowls you are eating. You need to leave yourself one last proper bowlful. Because if you mix this pre-packaged desperation cereal with the remainder of another cereal, I’m pretty sure the bowl will burst into flames. 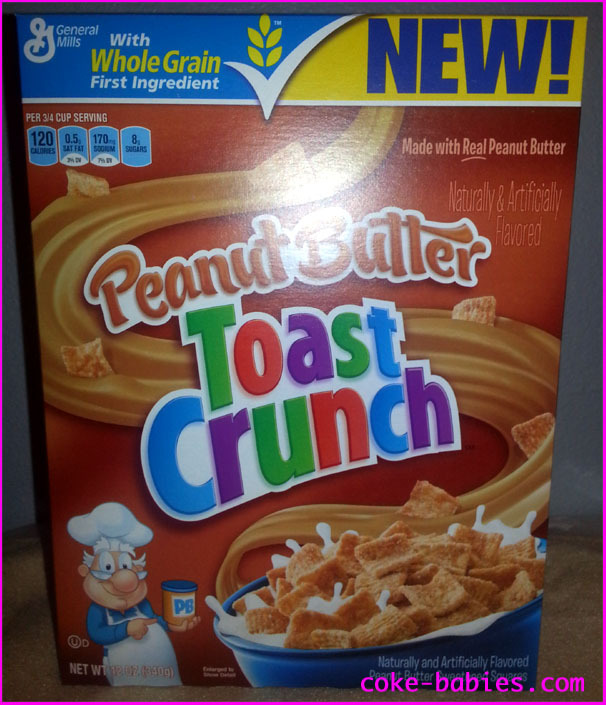 Despite the presence of the word “NEW” in size seventy font on the box, when I saw Peanut Butter Toast Crunch on the shelves, I first assumed it had been around for a while. I have no idea why. For some reason, I don’t like the box. It’s “brown, brown everywhere!” 70’s vibe makes sense with the peanut butter theme, but it’s just sort of ugly. I also don’t like that Wendell is doing that thing with the peanut butter that people do in photos, where they point at the person they are standing next to. Although I understand why he’d be smug, having gotten away with murdering the other two bakers he used to work with. 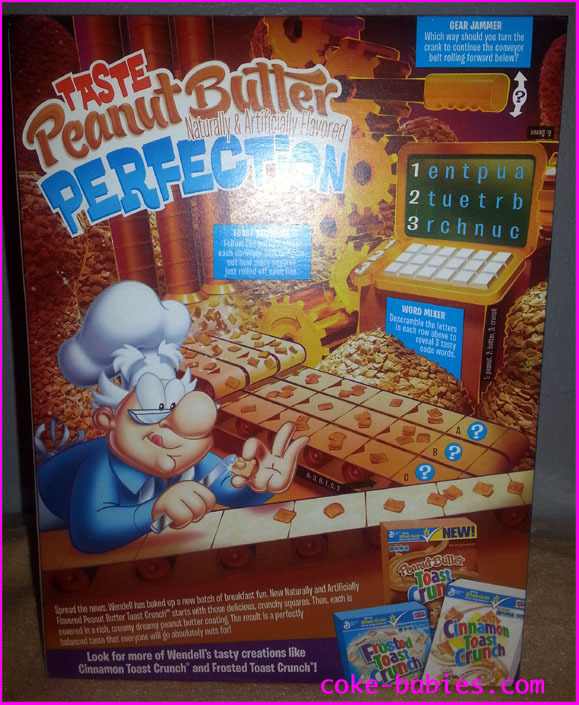 The back of the box reveals the disastrous conditions the cereal is made in. Having gigantic piles of cereal pieces sitting on a factory floor seems incredibly unsanitary. As does the fact that every single cereal piece gets touched by Wendell’s bare hands. Lip-licking creep. Despite the fact that it is covered in hand germs and has been sitting on a factory floor, the cereal itself is quite good. I didn’t know if it would have a lot of that weird, thick coating that some peanut butter cereals have. It has a slight coating, but nothing off-putting. 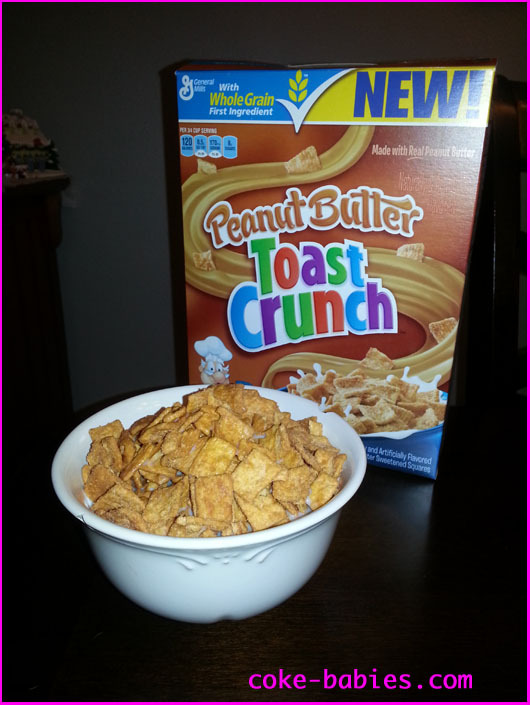 What Peanut Butter Toast Crunch does well is balance the peanut butter flavor with the sweetness. It doesn’t taste as sweet as Cinnamon Toast Crunch – it seems a bit more dialed back. While they claim it is made with “real” peanut butter, I was still expecting a more fake flavor, like in Peanut Butter Cups. The Crunch’s flavor is halfway between Reese’s fake flavor and real peanut butter. The taste it most closely resembles is the crackers in those peanut butter sandwich crackers. The milk takes on a bit of the peanut butter flavor, which was nice. Even though, as I write that, I realize “peanut butter flavored milk” doesn’t actually sound like a positive thing. Boy, this stuff is disgusting. Have you ever wished for a refreshing soda that tasted like that pink amoxicillin you had to keep in the fridge? Well you’re in luck! I don’t know the science behind it, but it seems whenever a diet soda specifies the number of calories it has in its name, it tastes better. Pepsi One was better than Diet Pepsi. Coke Zero tastes better than Diet Coke. Dr. Pepper Ten tastes better than Diet Dr. Pepper. Unfortunately, Dr. Pepper 10 has one of the worst ad campaigns in recent memory. Their “It’s not for women” seems to arbitrarily focus on men, for no apparent reason. Marketing like this can be taken anywhere from a silly throwback to boys versus girls of childhood to flat out misogyny. I’d find it more offensive if it weren’t so absolutely stupid. I assume this has something to do with attempting to shake the stigma that men are too ashamed to drink diet sodas – something that probably hasn’t been true for decades (if it ever was). Even if they wanted to pursue this line of thinking, they didn’t need to follow the questionable path laid out by Axe. Since the target market for a campaign like this is obviously stupid people, there are myriad ways of getting their attention that don’t involve a bad campaign like this. “Hey you know when you’re at the bar with your bros slamming Jager Bombs and Flaming Dr. Peppers? Look on the label right above this! It says Dr. Pepper! Buy this!” would be more effective. Hopefully, Dr. Pepper doesn’t continue down this slippery slope of advertising. We don’t need to have the introduction of Dr. Pepper 5, with it’s catchy “It’s only for the gays!” slogan. Seriously, though, Dr. Pepper – this is a really stupid ad campaign. You’ve always been one of the coolest sodas – you’re too good for this. Dr. Pepper seems to be throwing its budget in only two directions: attracting the Bro demographic, and fans of The League. Which is worrisome, since I like The League. Although I can never tell if I find their clumsy product placement funny or just sad. All this would be a moot point if Dr. Pepper 10 wasn’t so good. It is a significant improvement. I can’t be bothered with the specifics, but basically the concept is just using a little sugar / fake sugar is all you need to cover up that “diet” taste. This is a much better calorie balance than things like Pepsi Next, which involve a much more significant calorie commitment. For the longest time, I assumed Dr. Pepper was made by Coca-Cola. This long-standing theory is solely due to the fact that they were usually on sale at the same time. At almost every supermarket I’ve ever been to, it’s the same schedule: Pepsi on sale one week, Coke on sale the next – repeat. Dr. Pepper was on sale with Coke, so I figured they were all part of the same team. But apparently, Dr. Pepper is part of the Cadburry Schweppes family, and is just distributed by Coca Cola sometimes. Or something like that, anyway. Point being, Dr. Pepper being part of its own family is the reason for the seemingly random assortment of new Ten sodas. 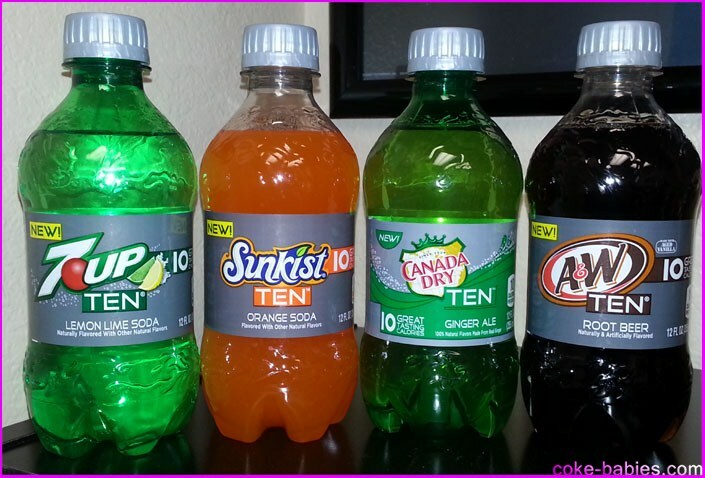 The new lineup of Tens consists of Dr. Pepper, Sunkist Orange, 7-Up, A&W Root Beer, and Canada Dry Ginger Ale. I have also read that RC Cola will be part of this, but I have yet to see this in stores. I question some of the logic of this roll out, mostly because these sodas seem too small to need a second diet option. Dr. Pepper itself is pretty big, so I get that. But are there enough people drinking Diet Sunkist who need an alternative? Speaking of Sunkist, let’s start with that. Based on all five of the labels, it seems that the theme of the Ten line is “grey”. All of the labels are either entirely grey, or have it heavily integrated into the design. I don’t know if there’s a deeper “this is the shade of grey between diet and sugared soda” thing going on. If that wasn’t intended, then I am taking credit for it! Even though a “grey” theme sounds at best boring and at worst depressing, it actually works quite well. Maybe we can call it “silver”, instead. That sounds less sad. Sunkist Ten’s flavor is a nice improvement. It has a good “orange Popsicle” flavor to it. And the hint of high fructose corn syrup (yum!) is just enough to hide almost all of the diet aftertaste. 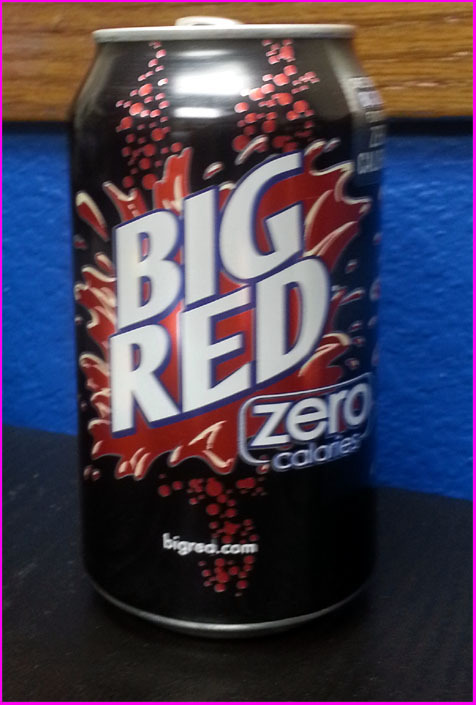 The flavor is really good, the one downfall is the soda has an odd consistency. There is definitely carbonation, but there’s also this thick, syrupy wave that comes along with it. Somehow it feels like it is half carbonated soda and half syrup, just not mixed together. It has a strange feeling on the roof of your mouth. I finished the soda before it got flat, but I have a feeling this could get really peculiar to drink once it loses what carbonation it starts with. Strange consistency aside, the flavor is there. I don’t think it’s as big a flavor improvement as Dr. Pepper 10 is over Diet Dr. Pepper, but it could carve out its own place. Before moving off the subject of fruit sodas – can a major soda company please put a diet grape soda into wide distribution? Thanks. Like when I reviewed Pepsi Next, I’m not going to address if there is a sustainable audience for the soda, I’m just going to discuss the taste. Otherwise, I’d really question whether a ginger ale needs another format. But no – I will not ask that! I go into any ginger ale with a strong prejudice. This is because, 95% of the time, the only reason I drink it is if I have a stomach virus. So on the odd occasion where I do have it, it reminds me of having a stomach virus. That’s not exactly one of those “remember all the great times you had with our product” moments that companies strive for. It could be because I don’t drink it too often, but I don’t remember ginger ale having such a bite. It could be due to the “real ginger” Canada Dry says they use. Of course, “ginger” isn’t specified in the ingredients – it falls under “natural flavors”. At this point, I will assume Canada Dry’s bite is due to ginger. It gives it almost a tonic water flavor – where it’s sweet, but has something different to offset the sweetness. Honestly, the ginger bite put me off at first; it tasted odd to me. But after a few sips, I really grew to appreciate it. I don’t think I have actually had regular 7-Up since I was about seven years old. I’ve had the diet variety since then, although not too often. Lemon-lime sodas are never very interesting to me. However, I will forever be a fan of 7-Up, for them sending me a Diet 7-Up Taste Test Kit a while back. That is still one of the coolest things I’ve ever gotten in the mail. I don’t know if that is sad or not. Due to the inherent boringness of lemon-lime sodas, I was very surprised to find out that I really liked 7-Up Ten. It doesn’t break any new ground in the world of limon-ness, but it does its job well. Out of all four of the new Tens, this may have hid the diet taste the best. The final member of the class of Ten is A&W. A&W has always been my favorite of the major root beers. Barq’s can piss off with its “bite”. And Mug is pointless. A&W Ten does upholds the good name of A&W. It seems to have less of that weird syrup and carbonation not getting along texture. The taste itself is fantastic. I atrocious at describing tastes, because usually my thought process is, “… it’s good.” But this is one of those rare instances where I can notice a pretty significant flavor profile. A&W Ten has all the root beer hit up front, but right after swallowing you get a good wave of vanilla on the back of your tongue. A&W insists this is “Aged Vanilla”, but I can’t say for sure. And any jokes that could be made about that veer into a creepy direction really fast, so I will just move right along. Some minor missteps with the texture aside, the new Ten line is a solid addition to the world of sodas. Will they all be successful? Probably not. But they are definitely good, so I think at least a couple of these varieties will find a loyal audience. Then again, I was a loyal fan of Pepsi One, and they took that away from me, so what do I know?